Chris - Yes, they are. Potatoes actually entirely are poisonous. They are a member of a family called the solanaceae. They make a toxin which is a neurotoxin called solanine. If you eat 5 kilos of potatoes that's actually a fatal dose. Watch it Kat, next time you're feeling peckish...! The solanine tends to concentrate in the areas that are exposed to light. This creates a sort of "traffic light" that the potato has been exposed. The green colour is chlorophyll, although it's not the greenness that's bad for you. 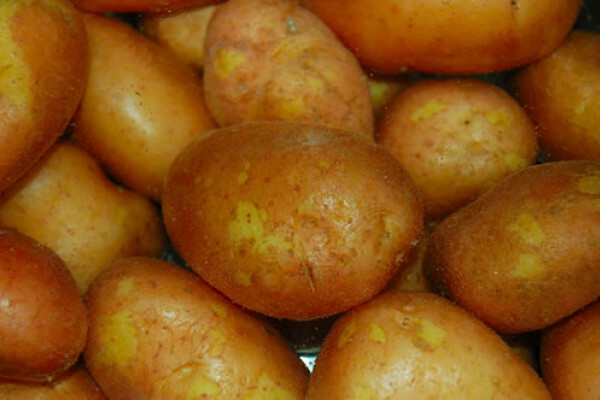 The potato makes the toxic solanine in regions that are exposed to light because they are also exposed to insects that might try to eat the potato. So it's the potato's way of protecting itself, by enriching the flesh with neurotoxins in the regions most vulnerable to pest attack. So, if you see a green potato, it's likely to have these solanine glycoalkaloids enriched in the flesh in the green areas and it could poison you. A small amount will almost certainly not affect you, but a larger dose could cause symptoms including an upset stomach. But definitely stay away from 5 kilos-worth! Previous Why do songs sound better the more we listen to them? Next Are hot air hand dryers an infection risk?